By combining the highest standards of design and craftsmanship with natural materials and subtle details, McGuire helps you create distinctively informal rooms that will make everyone feel welcome, at ease and comfortable. 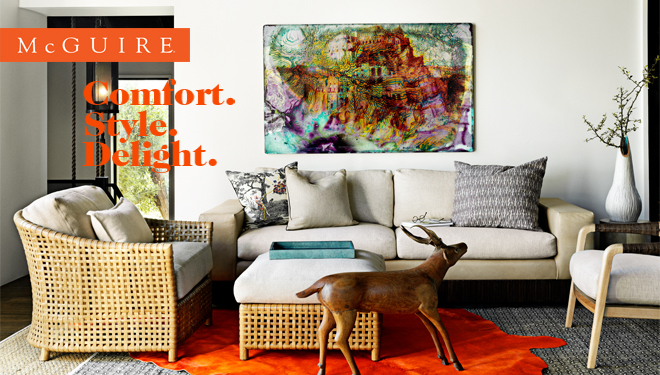 Create timeless, casual rooms by choosing what you love, or customizing a piece to make your own distinct statement. McGuire is internationally known for creating designer furniture of mixed materials such as rattan, solid teak, bamboo, hardwoods, laced rawhide, concrete and steel. Working with acclaimed designers such as Barbara Barry, Orlando Diaz-Azcuy, Thomas Pheasant, Jonathan Browning, Steven Volpe, Laura Kirar and Marmol Radziner, this flagship showroom offers an extensive collection of furniture and lighting uniquely suited for today's interiors.